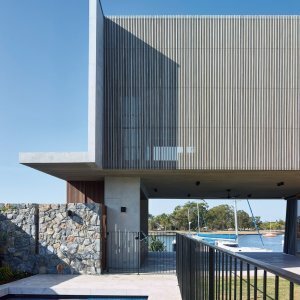 Sitting proudly on the edge of Sunshine Coast’s Mooloolah River is Shaun Lockyer Architect’s V House, winner of the 2018 Architecture Institute of Australia Sunshine Coast House of the Year. 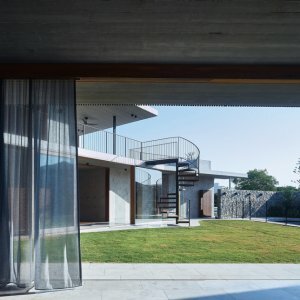 The property boasts a dual storey residence with a floor plan indicative of the home’s name; its V-shape hugging the boundaries of the property. 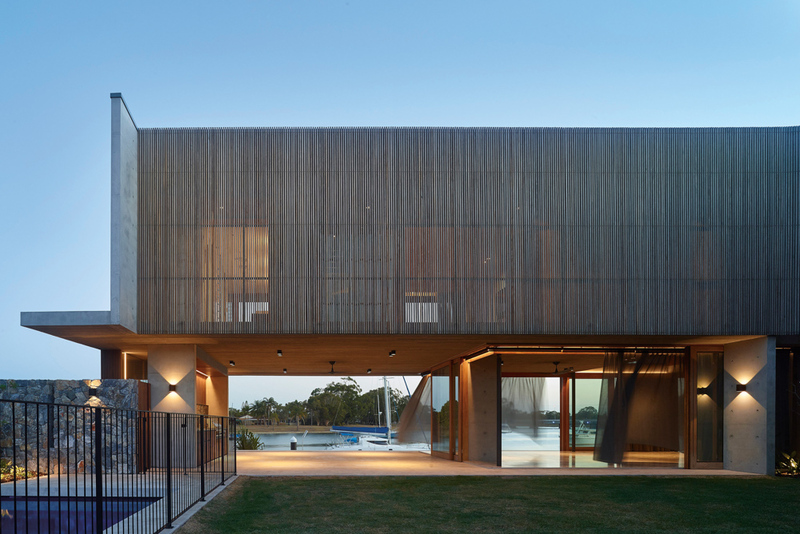 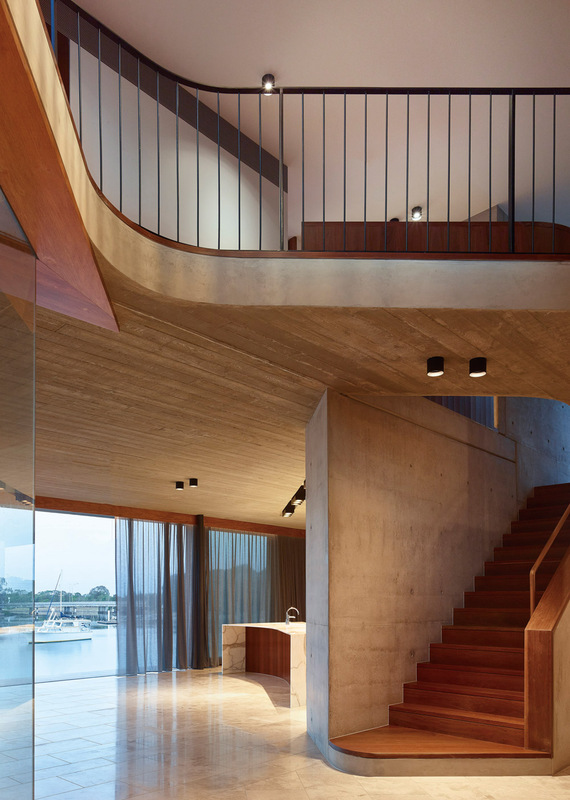 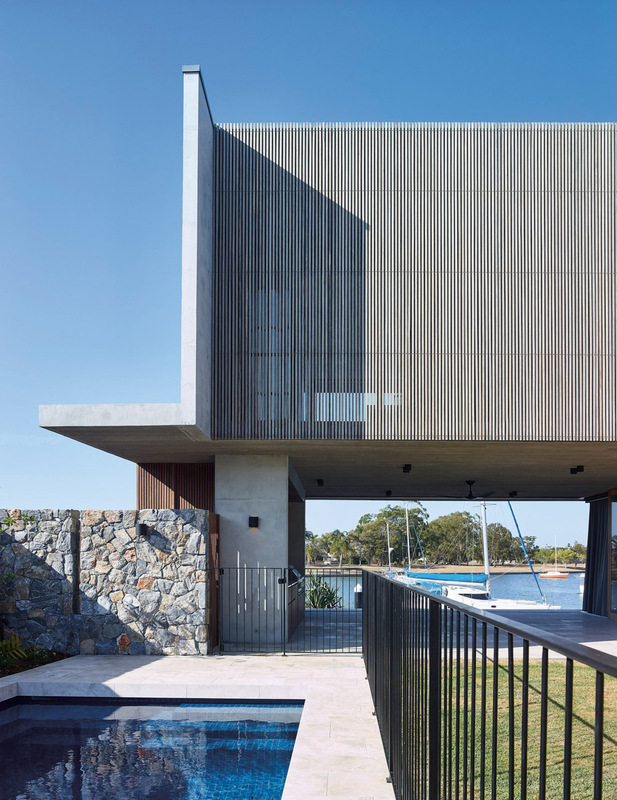 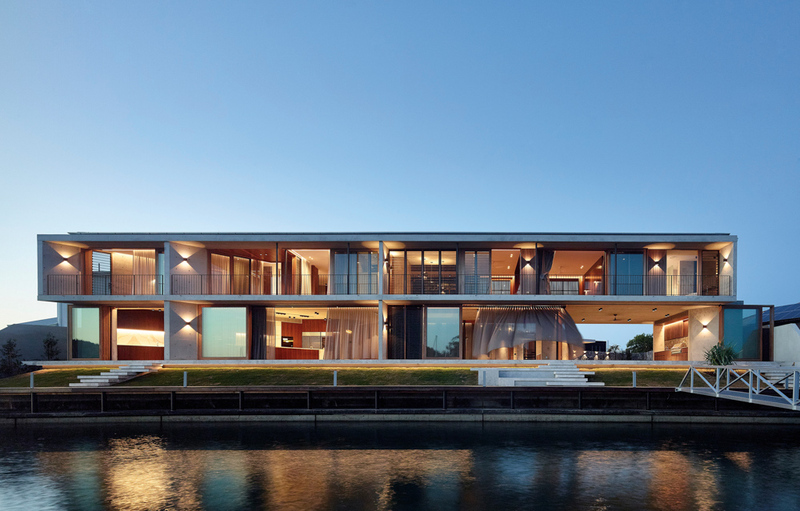 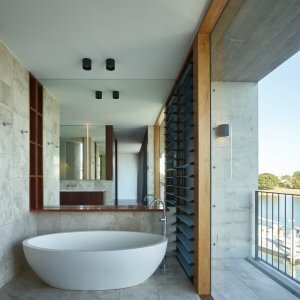 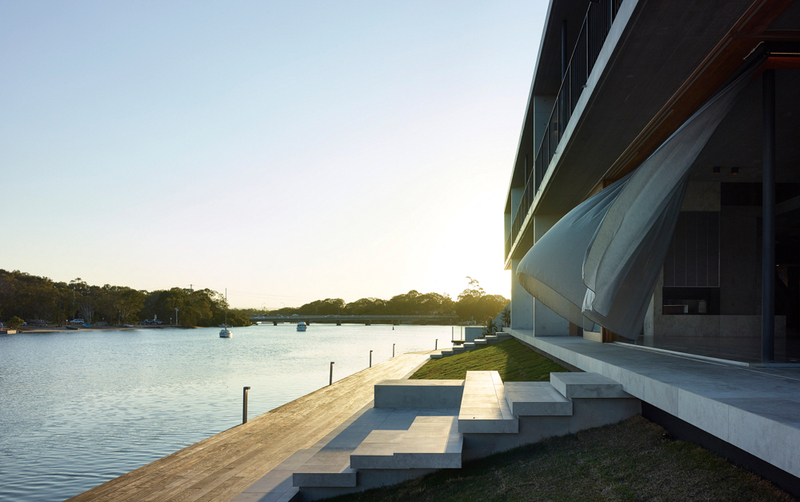 The irregular shaped block harbours a deep-water canal view to the south, with the transparent living pavilion opening the home to lapping water at the property’s banks, a vivid connection to the sultry setting of the Sunshine Coast. 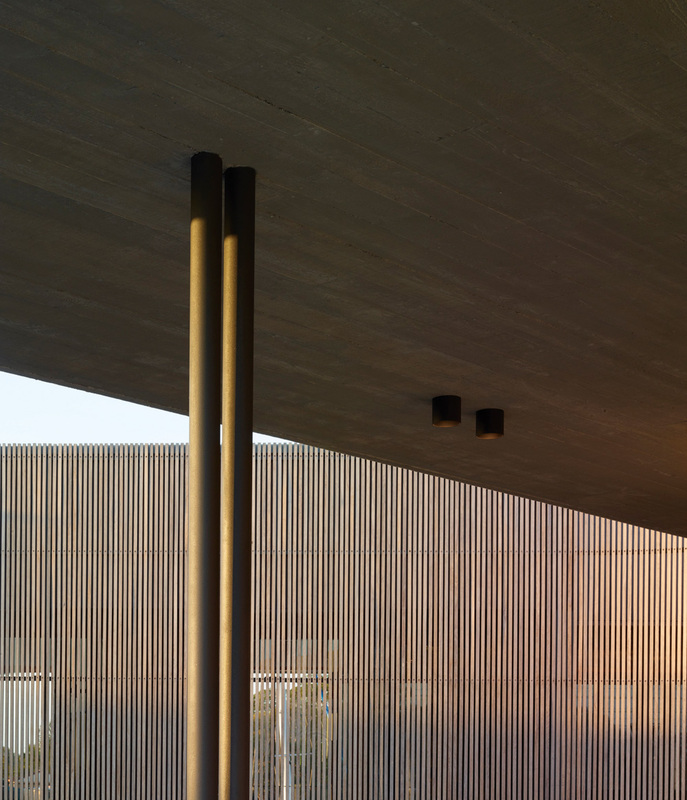 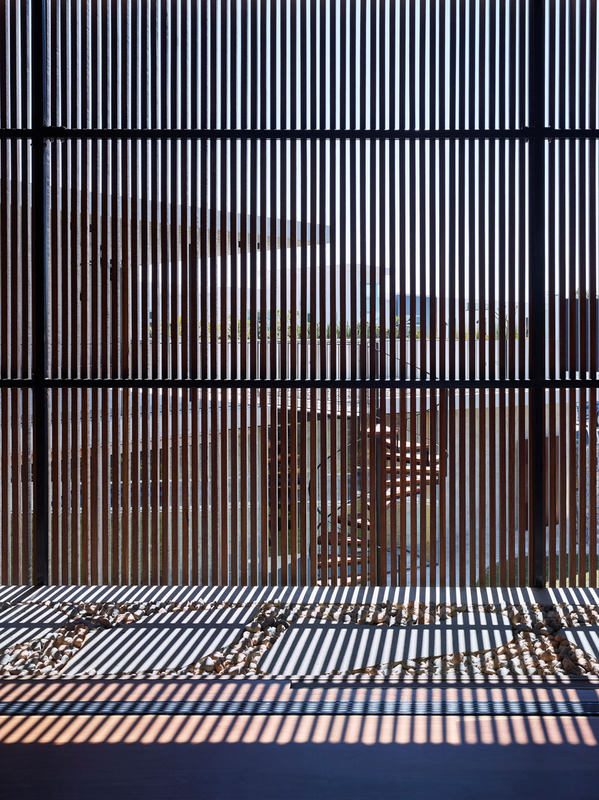 Characterised by the casting of shadows, the timber screened walls provide a textural, animated fringe of ever-changing light. 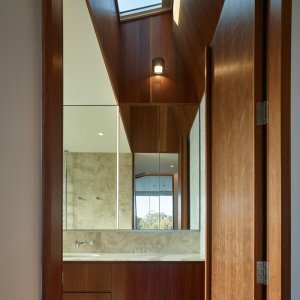 Highly refined detailing complements a clear framework reducing barriers between internal and external spaces throughout the ground level. 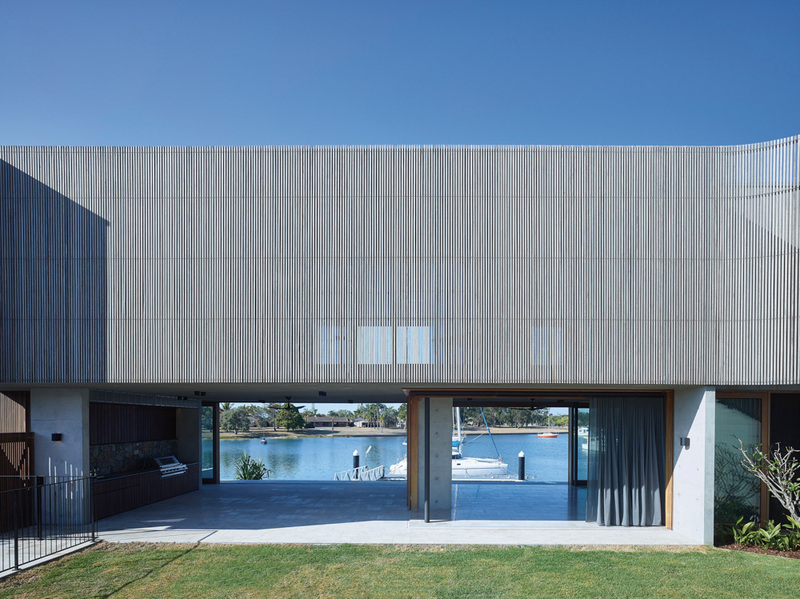 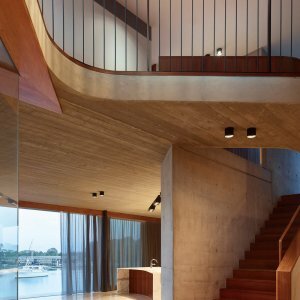 Mixing industrial elements with the serene surrounds, concrete blocks mount timber decks that survey the canal from the second storey, conveying a poetic yet pragmatic response to the block. 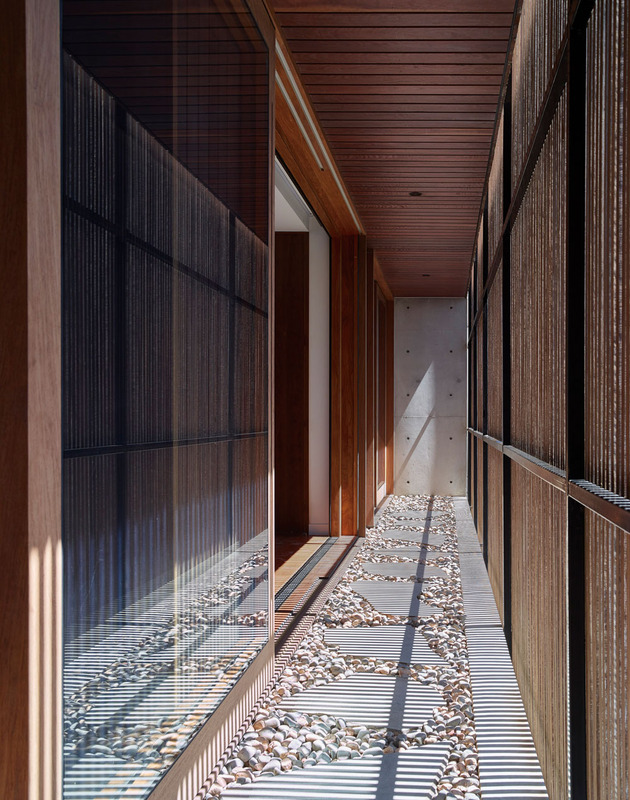 The play between transparency and permanence is evident as one transitions from semi-private to private along a sensory journey through light filled spaces and sculpted voids, all of which reinforce the delight of the experience. 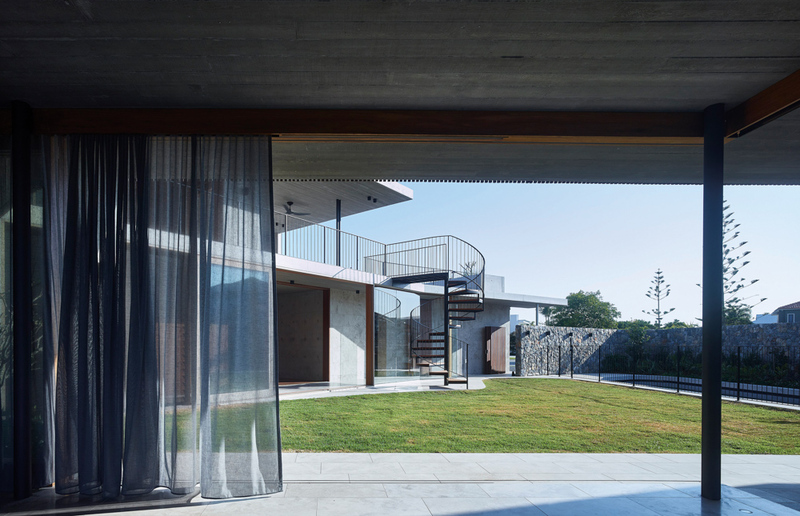 The entry sequence begins at the street establishing a transparent spine to the primary living spaces which hug the southern edge of the property. 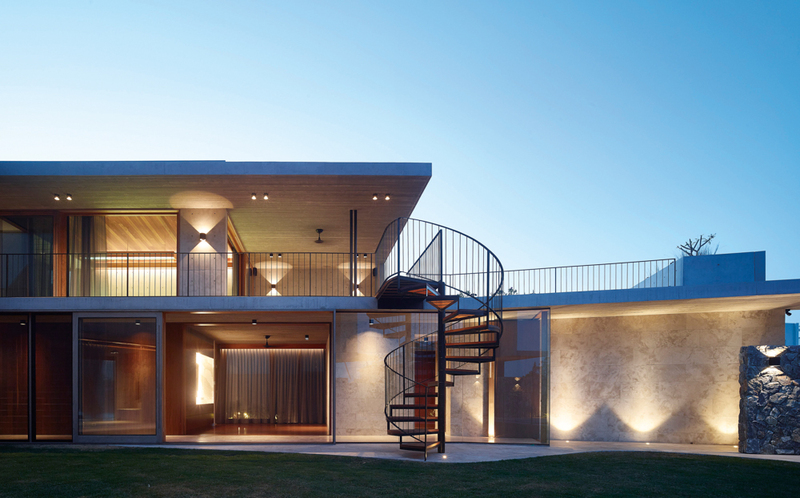 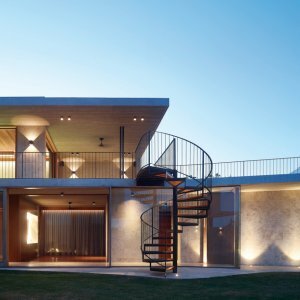 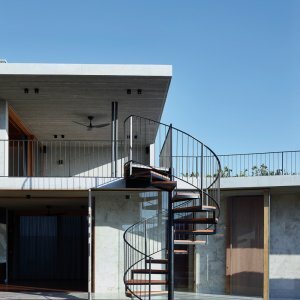 Private bedrooms and a games room occupy the first floor, enjoying a landscaped rooftop terrace on the northern edge accessible from the courtyard below via a sculptural steel spiral stair. 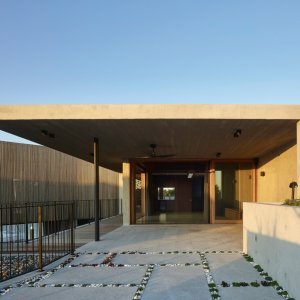 The house instead presents to the street as a stone-clad, heavily-landscaped form in a non-conventional way. 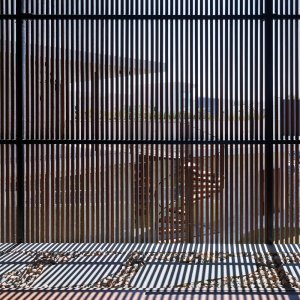 The highly animated timber screen presents as a Japanese lantern by night offering a pleasant and warm edge to the public realm. 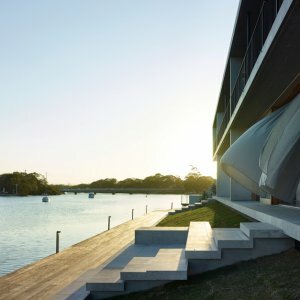 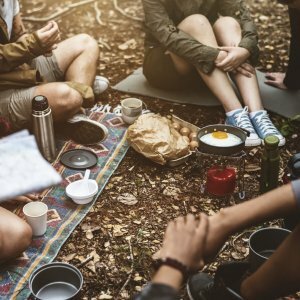 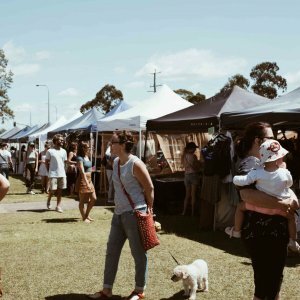 Robust, highly durable materials intended to weather will hopefully offer a more sustainable long-term alternative to the typical housing typology in the area. 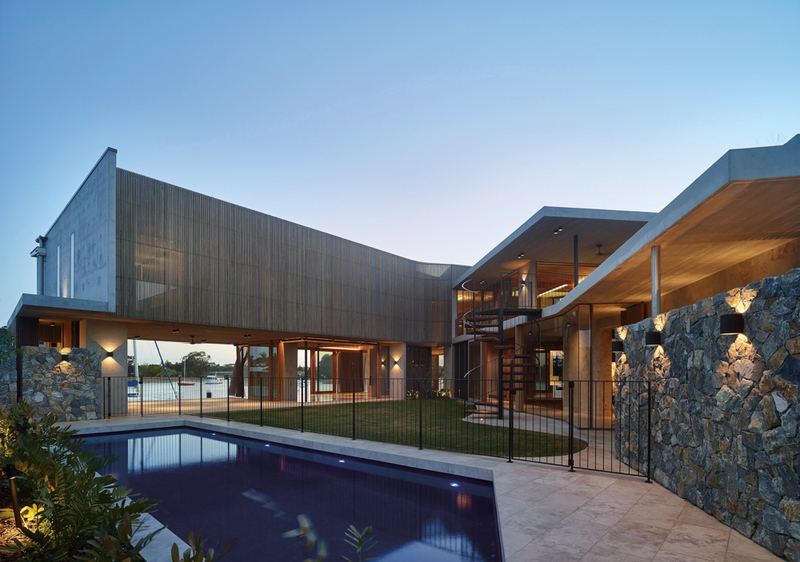 While rational in form, this was a very complicated and unforgiving house to build, according to Shaun Lockyer. 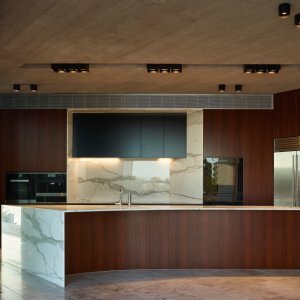 A heavy engineering focus by Westera Partners along with thorough input from builder CGH Constructions made for a seamless process. 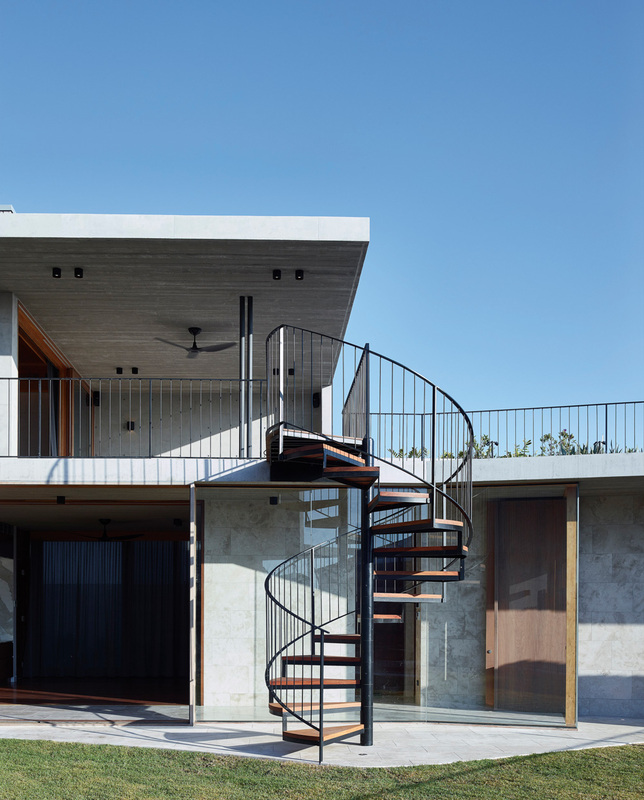 The V House is a holiday house that will become the permanent home for the owners, and while the house is large, it has a human scale and intimacy which allows smaller groups to feel comfortable in the space. 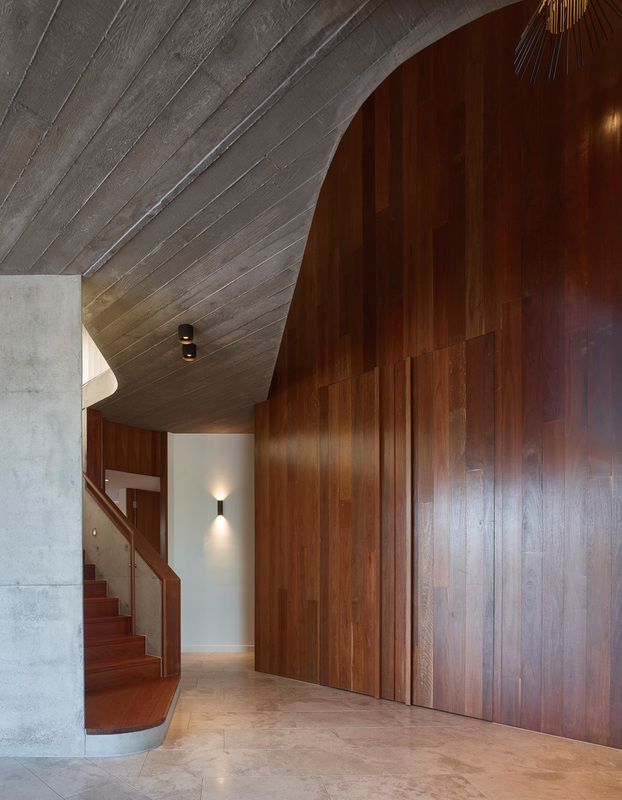 This is a robust, hardwearing home intended to gracefully age and limit maintenance. 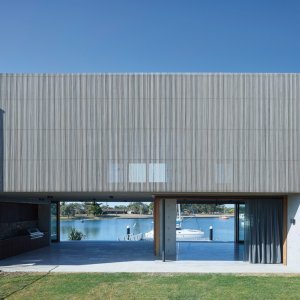 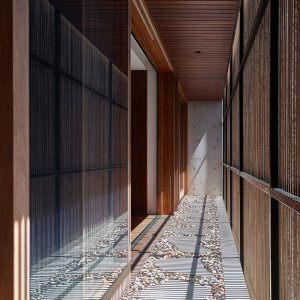 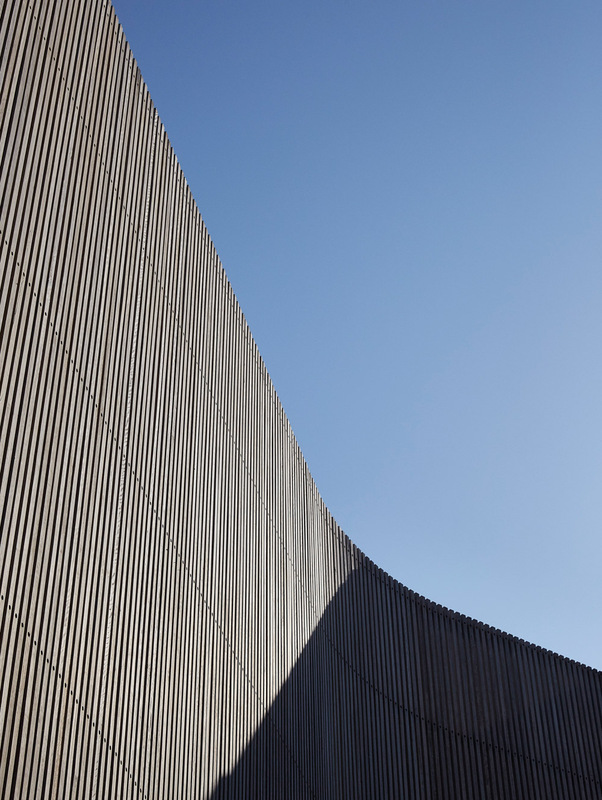 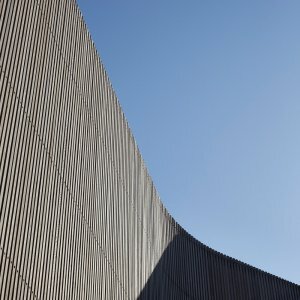 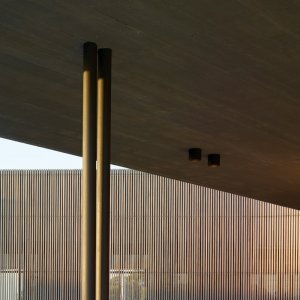 The timber rain screen offers shade, protection and security responding to the sub-tropical context. 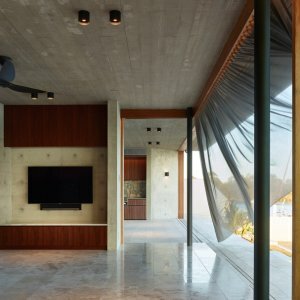 Deep eaves, excellent cross-flow ventilation, thermal mass and natural lighting make for a very sustainable long-term proposition. 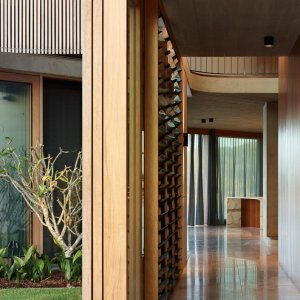 Solar power, battery storage, low-E glazing, LED lighting and FSC hardwoods complete the architect’s approach to creating a relevant and enduring home. 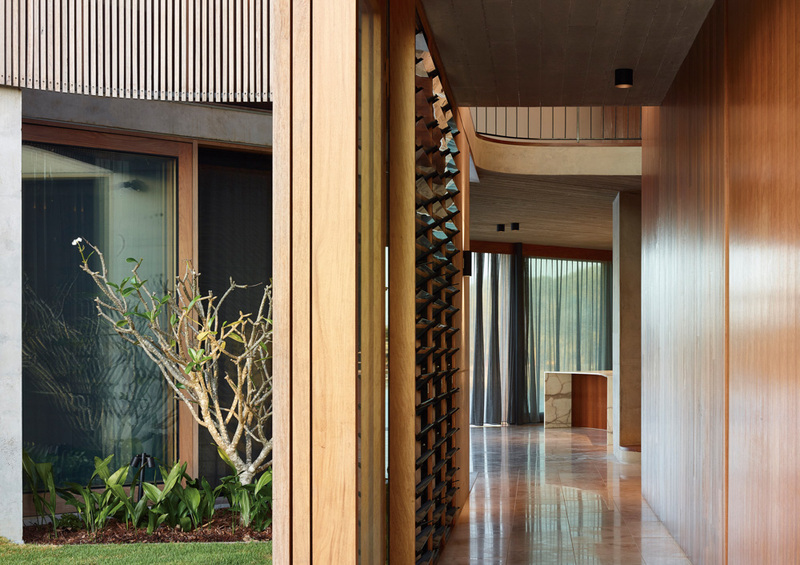 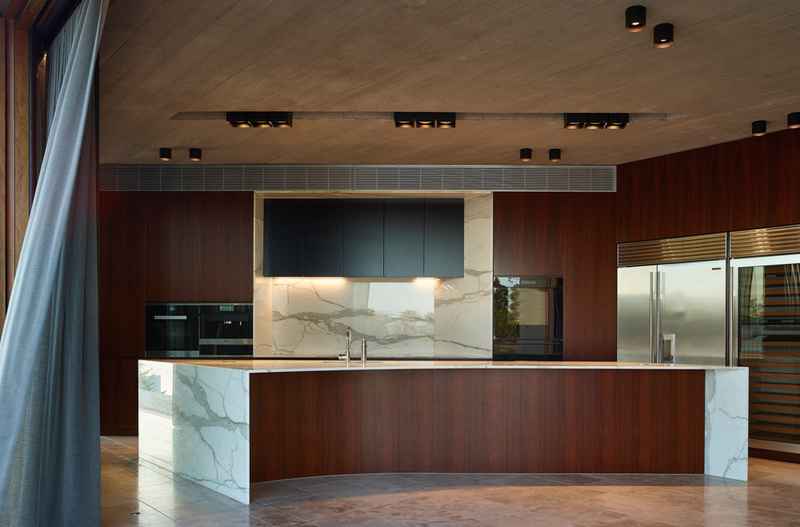 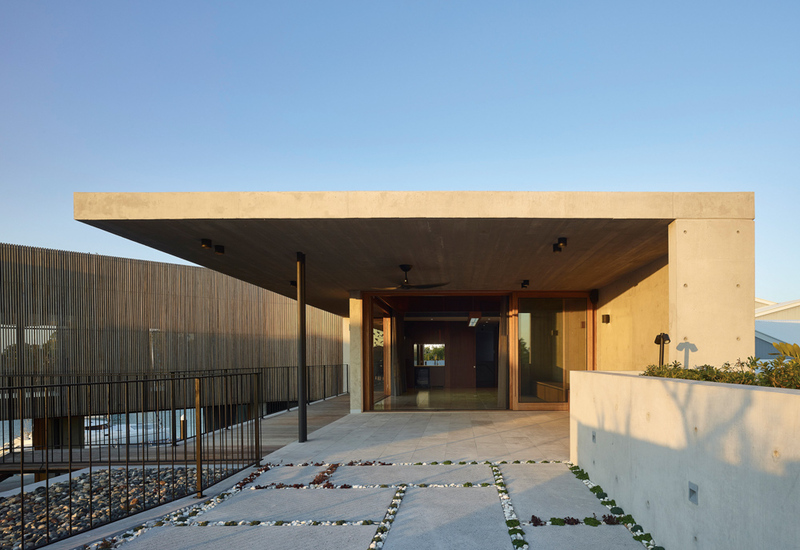 The richness of the detail and crafting is evident throughout V House as one moves through spaces bound by travertine, timber framed glazed walls and board formed concrete. 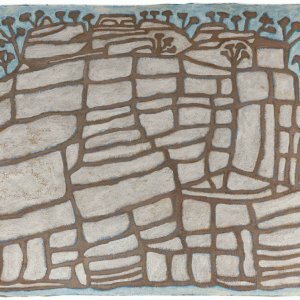 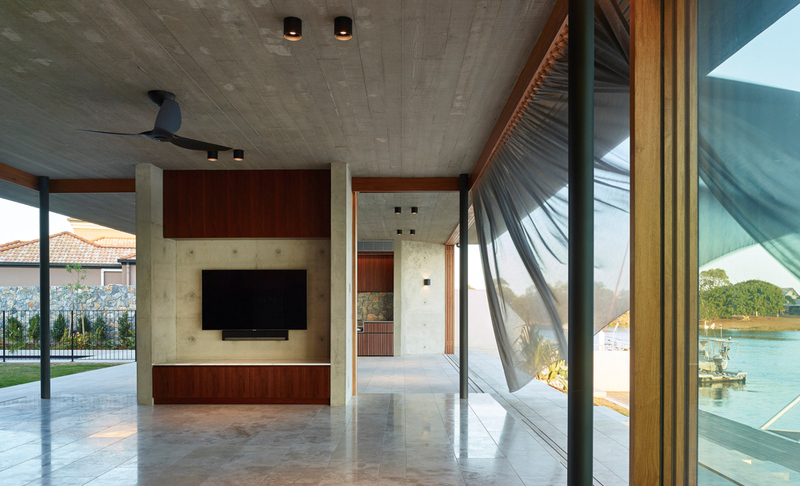 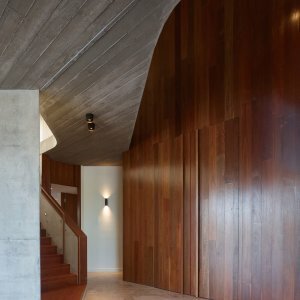 Embracing irregularity, V House is a testament to Shaun Lockyer’s dialogue of concrete, timber and stone, drawing heavily from both modern and South American subtropical narratives. 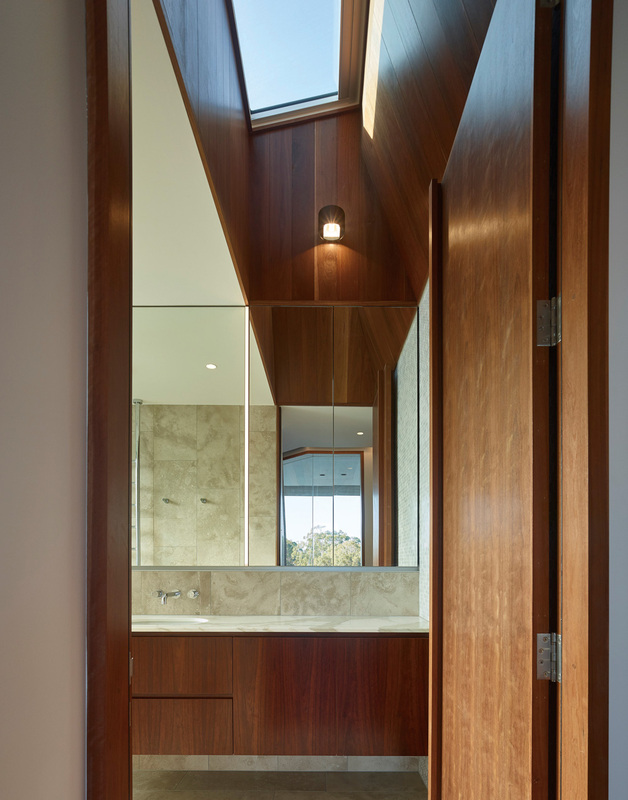 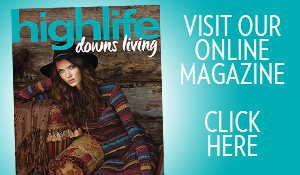 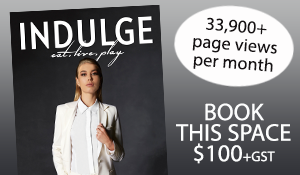 Readers also enjoyed this story about this Noosa Hinterland home.